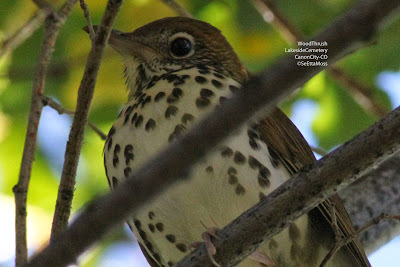 I found this Wood Thrush this morning skulking high up instead of low down as they are known to do. 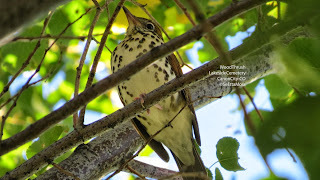 It was in a medium sized deciduous tree in the Lakeside Cemetery in Canon City, Colorado-far from it's usual haunts several hundred miles from Colorado. It was not cooperative in letting me see it's field marks as it stayed above me and I was never able to see it's upperparts except for quick views of it's rusty-brown head when it would look down at me when it heard my camera click. In fact when I first spotted it, and it spotted me looking at it, it moved away from my view and worked it's way around the tree so I lost it for about 5 minutes. When I spotted this beauty this morning I said 'wow'-it was such a stunning butterfly especially as it fed on the bright yellow blooms of the rabbitbrush on which it is photographed. Giant Swallowtail butterflies have a wingspan of 4-6 1/2 inches making them the largest butterflies in the United States. And this one was close to the max so I was truly awed by both it's beauty and exceptional size. Giant Swallowtail butterflies range from the eastern states west to the Rocky Mountains and then across the Southwest then south as far as South America. And in 2012 they were found in Montreal, Canada which is a very surprising northern range expansion thought to be related to warming temperatures according to the Montreal Botanical Garden where they were discovered.